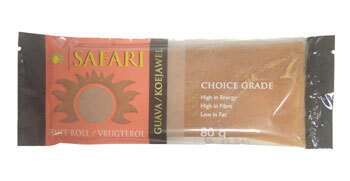 Made from sun ripened dried guava, which are high in dietary fibre and is fat and cholesterol free. A tasty and healthy snack that is quick and easy when on the go. Fruit pulp and minced dried fruit (92%), (guava pulp (75%) and pears (17%)), sugar, preservatives (sodium metabisulphite and Sulphur Dioxide).